Does Spinal Analgesia have Advantage over General Anesthesia for Achieving Success in In-Vitro Fertilization? 1Department of Gynecology, Semnan University of Medical Sciences, Semnan, Iran. 2Department of Reproduction & Infertility, Tehran University of Medical Sciences, Tehran, Iran. 3Department of Anesthesiology, Tehran University of Medical Sciences, Tehran, Iran. 4Department of Gynecology, Tehran University of Medical Sciences, Tehran, Iran. 5Departmemt of Surgery, Semnan University of Medical Sciences, Semnan, Iran. 6Research Center for Social Determinants of Health, Semnan University of Medical Sciences, Semnan, Iran. Aghaamoo S, Azmoodeh A, Yousefshahi F, Berjis K, Ahmady F, Qods K. Does Spinal Analgesia have Advantage over General Anesthesia for Achieving Success in In-Vitro Fertilization? Oman Med J 2014 Mar; 29(2):97-101. Objective: Because of high psychological burden and considerable costs of in-vitro fertilization, it is greatly important to identify all factors that may influence its results. In this study, general anesthesia and spinal analgesia used for oocyte retrieval were compared in terms of success in treating infertility among couples who had undergone in-vitro fertilization at an infertility center in Tehran, Iran. Methods: This cohort study that was based on analysis of patient records at Mirza Kochak Khan Hospital, Tehran University of Medical Sciences, in 2008-2009. In this study, the status of chemical pregnancy among those who experienced general anesthesia or spinal anesthesia for in-vitro fertilization for the first time were compared, and the possible effects of clinical and laboratory factors using logistic regression models were considered. 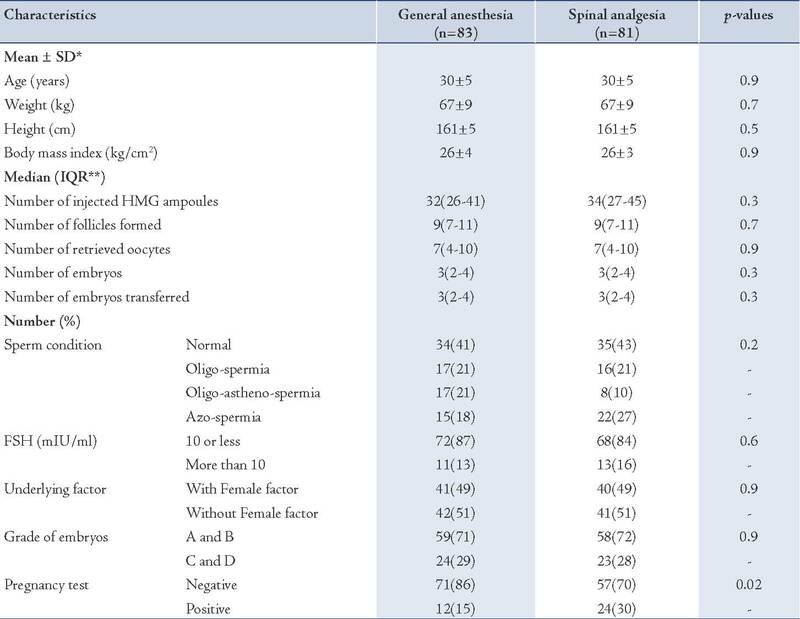 Results: Considering the number of transferred embryos, underlying cause of infertility and fetus grade, it was found that practicing spinal anesthesia is significantly related to increased chance of chemical pregnancy (adjusted Odds Ratio=2.07; 95% CI: 1.02,4.20; p=0.043). Conclusion: According to analysis of recorded data in an infertility treatment center in Iran, it is recommended to use spinal anesthesia instead of general anesthesia for oocyte retrieval to achieve successful in-vitro fertilization outcome. This can be studied and investigated further via a proper multicentric study in the country. Keywords: In-vitro fertilization; General anesthesia; Spinal analgesia; Cohort; Iran. In the present cohort study, two methods of GA and spinal analgesia (SA) were compared in terms of success in treating infertility among couples who underwent IVF in one of the most important centers of infertility treatment in Tehran, the capital of Iran. The study aimed to answer this important question: In a real context in an infertility center, considering the underlying conditions, does SA have advantage over GA for achieving success in in-vitro fertilization? This cohort study was based on analysis of patient records at Mirza Kochak Khan Hospital, Tehran University of Medical Sciences. The study was performed after obtaining the approval from Tehran University of Medical Sciences Ethics Committee. The goal of the study was to compare the status of chemical pregnancy (based on positive blood test) among those who experienced GA and SA while considering the possible effects of major clinical and laboratory variables. As an inclusion and exclusion criteria, the cohort only involved couples who attended a hospital in Tehran for the first time to treat primary infertility via IVF from October 2008 to March 2009. Only those patients who did not have any previous history of pregnancy, and did not experience cardiac, renal, pulmonary, hepatogenic, or metabolic diseases and thus, GA or SA was not medically contraindicated for them, were included in the study. The method of inducing analgesia was selected based on physician (or patient) preference and not because of any requirement or indication. Patients who failed to follow the induction caused by SA and underwent GA, women who suffered from infertility due to endometriosis and severe tuberculosis of fallopian tube, and those who had incomplete medical records were excluded. The data collection method had the following steps: first the research team made coordination with hospital authorities and the information needed including demographic and medical history of participants were carefully recorded in special forms which were pre-designed for this research. In the primary analysis, median and quartile ranges were reported for variables that did not have a normal distribution in the Kolmogorov-Smirnov test and their sub-groups were compared using the Mann-Whitney U test. Meanwhile, the averages were calculated for the rest of the variables and t-test was performed to compare the two independent groups. Also, categorical variables were compared using Pearson's chi-square test. The main step in statistical analysis was performed using logistic regression models; in the current study model, pregnancy was considered as the outcome and method of induction of anesthesia (or analgesia) was considered as the independent variable. Analysis was performed in three stages. Firstly, separated univariate simple models were allocated for each studied explanatory variable and crude odds ratios were reported. Then a multiple-model was employed with all of them. At this stage, the adjusted odds ratio for each variable was reported. In the third step, using backward method and based on the likelihood ratio test, the reduced model was extracted from multiple models. The final interpretation of the relationship between anesthesia and IVF success was done using reported adjusted odd ratios and based on the reduced model. Data was analyzed using STATA-9.2 software with the maximum type one error of 0.05. In this study, 164 women aged 19 to 40 years with an average age (±SD) of 30 ± 5 years were involved; the youngest was 19 and the oldest was 40 years old. From all, 90% were unemployed (housewives) and almost half of them (46%) had high school diploma. The cause of infertility in 83 couples (51%) was attributable to feminine factors (alone or together with male factors) and in 58% it was partly due to abnormal sperm. The success of IVF among women was 22% based on chemical pregnancy (blood test). Also, 83 persons (51%) underwent GA and 81 persons (49%) underwent SA for their transvaginal oocyte retrieval. The average operation time (±SD) from inducing analgesia or anesthesia until moving the patient to the recovery unit in two groups of GA and SA was 44 ± 12 and 43 ± 9 minutes, respectively; there was no statistically significant difference between the two groups (p=0.5). Table 1 presents the other characteristics of the two groups. As shown in Table 1, the mean age (±SD) for GA group was 30 ± 5 years and for SA group 30 ± 5 years; there was no statistically significant difference between the two groups regarding age (p=0.9). In addition, there was no statistically significant difference among the other characteristics between these two groups. Table 1 also presents the distribution of relative and absolute frequency of reported chemical pregnancies in the two groups of GA and SA. As it is shown, based on Pearson’s chi-squared test and based on the results of pregnancy test (p=0.02), a significant marginal relation between the anesthesia method and pregnancy can be reported. Therefore, from 81 persons undergoing SA, 24 persons (30%) had laboratory evidences of pregnancy. However, from 83 women who experienced GA for IVF, 12 persons (15%) were pregnant based on laboratory reports. Table 2 shows the univariate (crude) odds ratios as well as adjusted odd ratios of pregnancy for each of the studied variables classified by primary multiple and final reduced logistic regression model. Table 1: The characteristics of participants categorized by anesthetic technique and comparing them in two groups. Table 2: Univariate (crude) and adjusted odd ratios of pregnancy for each of the studied variables by fitted logistic regression models. As shown in Table 2, considering the number of transferred embryos which is the underlying factor for infertility and fetus grade, it was found that practicing SA is significantly related to increased chance of pregnancy (twice as much as GA), (adjusted odds ratio = 2.07; 95% CI: 1.02,4.20; p=0.043). Inducing analgesia for oocyte retrieval may reduce the success rate of an IVF program.18 Regarding its safety, specialists usually prefer regional analgesia more. There are three methods for regional analgesia: paracervical block, SA, and epidural analgesia.17 Because of technical acceptability and simplicity, SA is used more than the other two methods in gynecology and obstetrics.18-20 Another method which is still widely used is GA; GA is inherently associated with high risks of respiratory complications, aspiration, prolonged duration of hospitalization, and it probably affects its outcome.13,16 Since successful fertilization is dependent on several different and even unknown factors, some studies have been conducted to investigate the effective factors to improve fertilization,21 but more investigations must be done focusing on the type of analgesia method selected as well as considering temporal and spatial conditions. In a prospective study conducted by Hammadeh et al. the effects of two different anesthetic techniques (GA vs. sedation) used for oocyte retrieval on IVF outcome were compared. In the study, for GA, a combination of remifentanil with either propofol or isoflurane was used; while for sedation, the protocol included midazolam, diazepam or propofol. Overall, 202 women were enrolled in the study, 96 women opted for sedation and 106 for GA. In that study, there were no significant differences in pregnancy rates.18 However in a retrospective data analysis performed by Wilhelm et al. to compare the outcome of IVF in women who had underwent monitored anesthesia with remifentanil for oocyte retrieval with GA, pregnancy rate in women undergoing GA was significantly lower.15 Kim et al. in 2000 meta-analyzed four studies with distinct general and loco-regional anesthesia to evaluate the prospective trials comparing GA vs. all other types of loco-regional anesthesia on reproductive outcomes (pregnancy rate) for IVF. The pooled log odds ratio was 0.71 (95% CI: 0.47-1.08) in pregnancy. There was no significant difference in both groups of GA and other types of loco-regional anesthesia.16 Based on the results, this study showed inferiority of GA compared with SA to achieve successful IVF outcome. Moreover, it is recommended to use SA for oocyte retrieval instead of GA. Adjusting the number of transferred embryos as well as fetus grade,21 it was found that practicing SA is twice as much as GA related to increased chance of chemical pregnancy. The study compared the two techniques adjusting some influential factors and a statistical multiple-reduced-regression model was used which made the internal validity acceptable. However, it must not be overlooked that only a specific group of infertile couples who just used a special treatment method were involved in the study; it is an important obstacle to generalize the findings to all people who cannot access different techniques of infertility treatment. The anesthetic drugs used in the study are not controlled rigorously and it is another important limitation for the study. In this study, it was only possible to follow up chemical pregnancy, and the data of final outcomes were not studied, thus it is not possible to rely on the results to predict the long-term impact of the studied techniques on patients. In view of the rapid increase in the number of infertility treatment centers in Iran and due to inevitable differences in techniques used at these centers to treat infertile couples, it is highly suggested to conduct further comprehensive multicenter studies in the country to investigate and compare the advantages and disadvantages of every accepted and common method of induced analgesia for different infertility treatment methods while considering the background problems and diseases of couples, the type and dose of the drugs used, complications and limitations, and finally the success in the treatment. In summary the use of SA for oocyte retrieval can be suggested instead of GA to achieve successful IVF outcome, based on analysis of recorded data in an infertility treatment center in Iran. The present article was prepared based on a medical specialty degree thesis in the field of obstetrics and gynecology, supported by Tehran University of medical sciences. No conflict of interest to declare. 1. Tsen L, Vincent R. In vitro fertilization and other assisted reproductive technology In: Chestnut DH, Polley LS, Tsen LC, Wong CA, editors. Chestnut's Obstetric Anesthesia Principles and Practice. 4th Ed. ed. Philadelphia: Mosby Elsevier; 2009. p. 18. 2. Vakilian K, Mirzaii K; NajmAbadi. Reproductive health in iran: international conference on population and development goals. Oman Med J 2011 Mar;26(2):143-147. 3. Esmaeilzadeh S, Delavar MA, Zeinalzadeh M, Mir MR. Epidemiology of infertility: a population-based study in Babol, Iran. Women Health 2012;52(8):744-754. 4. Ben-Haroush A, Farhi J, Zahalka Y, Sapir O, Meizner I, Fisch B. Correlations between antral follicle count and ultrasonographic ovarian parameters and clinical variables and outcomes in IVF cycles. Gynecol Endocrinol 2012 Jun;28(6):432-435. 5. Hamilton BH, McManus B. The effects of insurance mandates on choices and outcomes in infertility treatment markets. Health Econ 2012 Aug;21(8):994-1016. 6. Pinto E, Pinelo S, Osório M, Ferreira C, Serra H, Pires I, et al. Outcomes from ovarian hyperstimulation following the sole administration of gonadotrophin-releasing hormone agonist in the context of in vitro fertilization: report of two cases and review of the literature. Gynecol Endocrinol 2012 Jul;28(7):545-548. 7. Roberts SA, Stylianou C. The non-independence of treatment outcomes from repeat IVF cycles: estimates and consequences. Hum Reprod 2012 Feb;27(2):436-443. 8. Vulliemoz NR, McVeigh E, Kurinczuk J. In vitro fertilisation: perinatal risks and early childhood outcomes. Hum Fertil (Camb) 2012 Jun;15(2):62-68. 9. Zander-Fox DL, Henshaw R, Hamilton H, Lane M. Does obesity really matter? The impact of BMI on embryo quality and pregnancy outcomes after IVF in women aged ≤38 years. Aust N Z J Obstet Gynaecol 2012 Jun;52(3):270-276. 10. Coskun D, Gunaydin B, Tas A, Inan G, Celebi H, Kaya K. A comparison of three different target-controlled remifentanil infusion rates during target-controlled propofol infusion for oocyte retrieval. Clinics (Sao Paulo) 2011;66(5):811-815. 11. Gonen O, Shulman A, Ghetler Y, Shapiro A, Judeiken R, Beyth Y, et al. The impact of different types of anesthesia on in vitro fertilization-embryo transfer treatment outcome. J Assist Reprod Genet 1995 Nov;12(10):678-682. 12. Hadimioglu N, Aydogdu Titiz T, Dosemeci L, Erman M. Comparison of various sedation regimens for transvaginal oocyte retrieval. Fertil Steril 2002 Sep;78(3):648-649. 13. Kwan I, Bhattacharya S, Knox F, McNeil A. Conscious sedation and analgesia for oocyte retrieval during IVF procedures: a Cochrane review. Hum Reprod 2006 Jul;21(7):1672-1679. 14. Handa-Tsutsui F, Kodaka M. Effect of nitrous oxide on propofol requirement during target-controlled infusion for oocyte retrieval. Int J Obstet Anesth 2007 Jan;16(1):13-16. 15. Wilhelm W, Hammadeh ME, White PF, Georg T, Fleser R, Biedler A. General anesthesia versus monitored anesthesia care with remifentanil for assisted reproductive technologies: effect on pregnancy rate. J Clin Anesth 2002 Feb;14(1):1-5. 16. Kim WO, Kil HK, Koh SO, Kim JI. Effects of general and locoregional anesthesia on reproductive outcome for in vitro fertilization: a meta-analysis. J Korean Med Sci 2000 Feb;15(1):68-72. 17. Miller RD, Eriksson LI, Fleisher LA, Wiener-Kronish JP, Young WL. Miller's Anesthesia 7th ed. Philadelphie: Elsevier Churchill Livingstone; 2010. 18. Hammadeh ME, Wilhelm W, Huppert A, Rosenbaum P, Schmidt W. Effects of general anaesthesia vs. sedation on fertilization, cleavage and pregnancy rates in an IVF program. Arch Gynecol Obstet 1999 Nov;263(1-2):56-59. 19. Halpern SH, Soliman A, Yee J, Angle P, Ioscovich A. Conversion of epidural labour analgesia to anaesthesia for Caesarean section: a prospective study of the incidence and determinants of failure. Br J Anaesth 2009 Feb;102(2):240-243. 20. Jain K, Bhardwaj N, Sharma A, Kaur J, Kumar P. A randomised comparison of the effects of low-dose spinal or general anaesthesia on umbilical cord blood gases during caesarean delivery of growth-restricted foetuses with impaired Doppler flow. Eur J Anaesthesiol 2013 Jan;30(1):9-15. 21. Cai QF, Wan F, Huang R, Zhang HW. Factors predicting the cumulative outcome of IVF/ICSI treatment: a multivariable analysis of 2450 patients. Hum Reprod 2011 Sep;26(9):2532-2540.